Readers of MacStories know how I like to present my screenshots. For the uninitiated, some context: screenshots from iOS apps that end up on MacStories are usually modified to have a clean status bar and, for iPhone apps, they're usually presented side-by-side with various layouts. I like how screenshots are displayed on MacStories, and, combined with a new workflow to optimize the resulting images for our CDN, this gives me flexibility and considerable savings (for both costs and time). I can take better screenshots spending less time editing them and less money hosting them. In the past couple of weeks, I've been playing with two new iPhone apps for combining screenshots on the iPhone – LongScreen and Tailor. 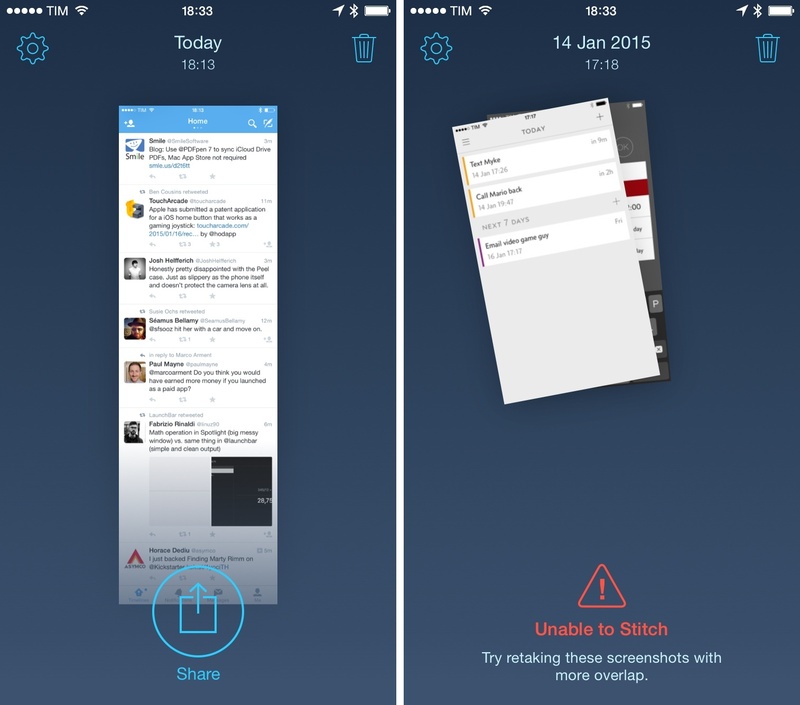 Tailor is the simpler of the two, and it can be used to stitch multiple screenshots vertically in one long image. While similar solutions exist on the App Store, Tailor impressed me for its ease of use. Say you want to create a long screenshot of a conversation on iMessage or a single image of someone's Twitter timeline. Once you've taken multiple screenshots with little overlap between them, Tailor is capable of automatically finding them in the Camera Roll, stitching them based on the order in which you took them. You'll end up with a long, seamless screenshot that only shows one status bar at the top and one tab bar at the bottom with no “connections” between the underlying screenshots. The effect is particularly nice in apps like Twitter and Messages, as it'll look like you're taking screenshots on a very long iPhone. Tailor is smart enough in that it won't stitch anything if it doesn't find multiple screenshots taken in rapid succession in your library; when it does, you don't have to pick anything manually as the app will start stitching images on its own. Twitter timelines stitched by Tailor. 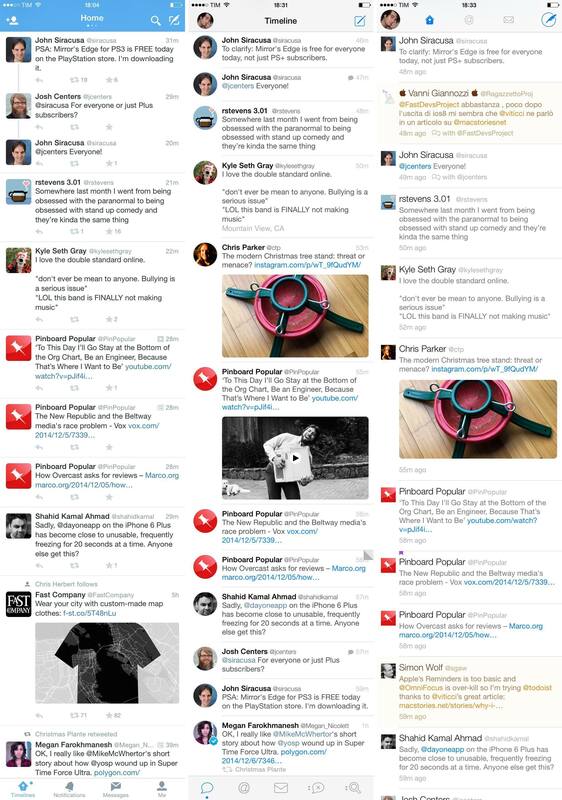 I used Tailor to create long screenshots for my Twitter feature story from December, and it worked admirably. My only complaint is that the app tends to crash when deleting previously-generated images and that there's no way to pick older screenshots – Tailor only finds new screenshots and has no manual mode. Tailor is a free download with a $2.99 In-App Purchase to remove ads. LongScreen is a slightly more complex utility that is not as fast as Tailor but has more features. Like Tailor, it can stitch screenshots vertically for one long image, but it won't automatically find images to stitch in your library. LongScreen needs you to pick screenshots you want to combine, and it shows you the order in which they'll be stitched with a blue badge for selected images. It's slower, but it works, and results are comparable to Tailor. Unlike Tailor, LongScreen can also combine screenshots horizontally and it can clean the system status bar. The option to have a better-looking status bar obviously resonates with me, and, for the most part, LongScreen implements this well. LongScreen overrides the status bar with a matching version that has full signal, WiFi, battery, and Apple's popular 9:41 AM time, but it only works for status bars that are based on solid colors. Unlike Dr. Drang's script, LongScreen won't fill the status bar on translucent backgrounds, which I need for many of the apps I cover on MacStories. Still, I'm glad the option is there. LongScreen can merge screenshots horizontally – another task that I've long automated with scripts in Pythonista. LongScreen provides a GUI for something that I've done in Python for a long time, and it even offers settings to decide the mode (tile or single row) and space between screenshots in the final image. I've used LongScreen's horizontal merge mode with status bar cleaning for apps that had solid status bars, and the app worked well for my needs. It's a bit unpolished and the settings aren't exactly intuitive, but it gets the job done and, like Tailor, it supports sharing images with extensions. 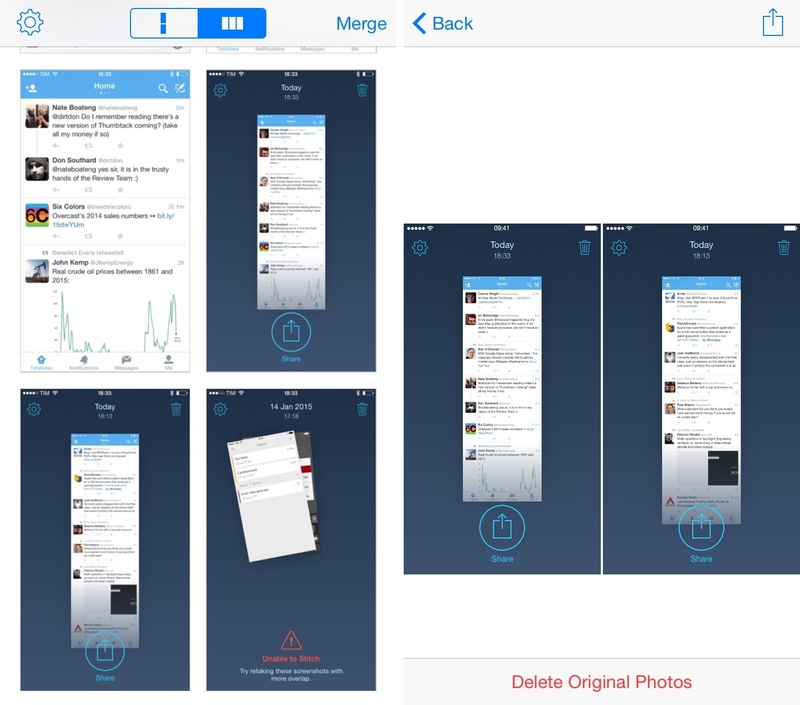 Thanks to iOS 8, LongScreen can delete the original screenshots from the Photos app, too. LongScreen is available at $0.99 on the App Store. I've used Tailor and LongScreen with a good degree of success in MacStories articles. I'm glad that there are developers who share my obsession with combining screenshots and optimizing them.